Back row: Iesha Green, Rashad Carswell, Pate Bauldree, Michael Townsend, Stephanie Beckler. Front row: Elizabeth Britting, Molly Kopplin, Wendy Miya, Brianna Sheely, Jason Curlin, Michelle Joyner, Laura White. The Arkansas Academy for Educational Equity at the University of Arkansas seeks to transform the way that teachers are prepared, supported, and mentored throughout their early career. 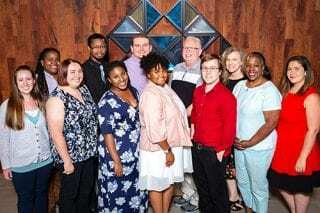 The inaugural cohort of 12 participating teachers has completed a rigorous summer training program and has now dispersed across the state to teach in high-need school districts. The program addresses the severe teacher shortage in Arkansas by recruiting talented and motivated teachers to relocate to Arkansas from nearby states such as Missouri and Tennessee and even as far as New York as well as supporting early-career teachers who are already teaching in our most struggling districts. The Arkansas Academy for Educational Equity has the support of the Arkansas Department of Education and collaborates with school districts across the state. Funding for the program has been made available through collaboration between the College of Education and Health Professions at the University of Arkansas and the Walton Family Foundation. This year’s cohort includes mathematics and English language arts teachers. In the future, the Arkansas Academy for Educational Equity plans to recruit teachers from at least four additional content areas including elementary education, science, special education, and English language learners. The members of the cohort began their time in the program with a rigorous four-week summer training institute at the U of A in Fayetteville designed to increase the effectiveness and support of these early-career teachers so they are better prepared to lead classrooms in high-poverty schools. During training, the teachers received expert content support, practical pedagogical resources, and coaching regarding best practices in the classroom. Applications for the 2019 cohort open in September; early career teachers of all ages and backgrounds are welcome to apply. Contact Jessica Pontoo, associate director of recruitment, at pontoo@uark.edu for information on applying. Teachers in the program receive continued support through ongoing, real-time coaching in their classrooms, group professional development sessions, and a second summer session next year. In exchange for their commitment to teach in one of our placement districts, teachers receive a $2,500 stipend, along with their full-time salary with benefits from the partnering school district. All participants share a deep commitment to making a difference across the state of Arkansas and an unwavering belief that students in high-poverty schools need a consistent high-quality teacher workforce.